All month long we have been discussing ways to be healthy and safe on Halloween. Today we are going to focus on the inevitable candy that is headed your way in a few short days. We always like to promote moderation and so a few pieces of candy to celebrate Halloween is okay. However, in saying that, we also like to recommend loading up even more on the healthy fruits and vegetables that are so good for your body. It also wont hurt to add in a little extra physical activity! As we head into the holiday season, it is important to remember moderation and also to focus on making healthy choices, including encouraging kids to eat more fruits and veggies, most of the time! Last time we talked about public speaking anxiety and how you can alleviate some of the stress involved with it. Generally, the act of public speaking isn’t what is so hard, it’s the worry and anticipation that leads up to it. Once a speech or presentation is over, it’s usually a relief and may leave one thinking, it wasn’t as bad as they expected. It’s important to teach kids about being confident and to remind them that the easiest thing to give a presentation on is themselves, or a topic that they know and have prepared very well. 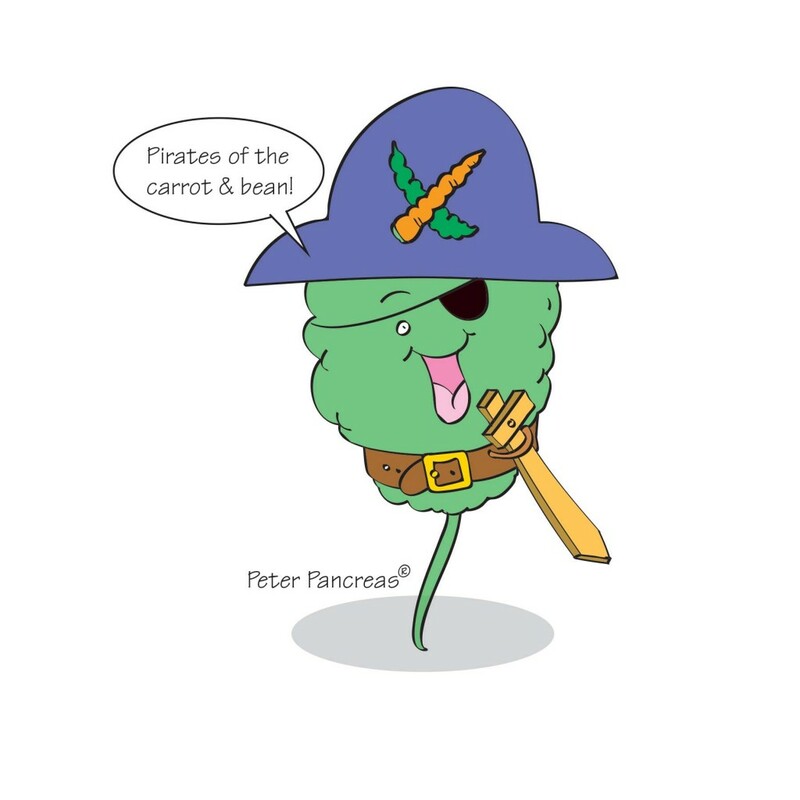 Peter Pancreas was nervous to give an “All About Me” speech. Today, Peter is here to let the kids know just how it went in front of his classmates. Make sure and download the coloring sheet and activity sheet which offers the opportunity for kids to tell all about themselves. Public speaking is a fear that is shared by nearly everyone at some point or another in their lives. So whether, in kindergarten or in college and even as an adult, at some point speaking in front of a group of people is bound to cause some anxiety. It’s important to teach kids to handle nerves in a way that is beneficial to them. Kids need to develop confidence in themselves at an early age. Encouraging kids to be prepared for what they will be talking about is important in helping them to gain confidence for their presentations. Remind them that it’s okay to feel a little nervous. In fact, that’s totally normal! Just make sure to teach to take deep breaths and be confident! Kids learn at a very young age that sometimes different things in life may cause anxiety and seem a little bit scary. Anxiety is not a bad thing, but a normal part of many situations that they will come across in life. It is important to teach them that it is okay to experience the feelings of anxiety and also how to deal with the feelings in a positive way. Download the coloring sheet for today to see what has Peter Pancreas experiencing some anxiety of his own. This is a great opportunity to talk to your kids about these feelings and the best way to deal with them! Good Luck! Rainy days, or those days that are just too hot to get outside during the afternoons, are great times to bring on the creativity at home with the kids. Think old school fun, where you turn off the technology and bring out a good old fashioned puzzle! Think back to your childhood and how fun it used to be to pull out the card table and set up a puzzle for the whole family to work on. You can also download the “puzzling” coloring sheet and activity sheet for today to keep the kids entertained on the aforementioned rainy or HOT days! Enjoy the kids and the creativity!